Joel Torre calls Gerald Anderson’s performance in ‘OTJ’ wonderful and award-worthy. Veteran actor Joel Torre believes that Gawad Urian as an acclaimed award-giving body has leveled out the playing field both for young and for seasoned actors. 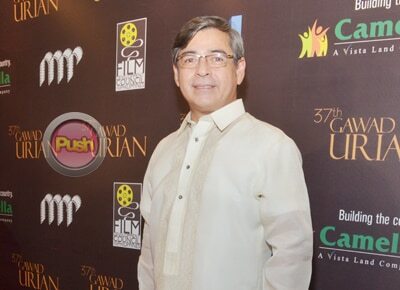 In an interview after the recently-concluded awarding ceremony, the 37th Gawad Urian Best Actor winner claimed that he never felt like he was a shoo-in for the category simply because the Manunuri ng Pelikulang Pilipino body has managed to maintain its reputation as an impartial judge of a movie or an actor’s artistry throughout the years. “No, It’s anybody’s ball game. So ang masasabi ko lang it’s very humbling. ‘Yun lang. I’m very, very happy pero nakakatuwa lang na naibigay sa ‘yo,” he blurted. According to the actor, he wouldn’t have had any issue if the Urian went to a younger nominee, like Sid Lucero who was nominated for Norte, Ang Hangganan ng Kasaysayan. Though it’s already his third Urian in his almost four decade-long career, Joel said his latest award for On The Job has a special place in his heart, especially since he realized how hard it was to get one. “Kasi ang last ko was about 12 years ago. Kaya sinabi ko kanina, it’s a very humbling experience parang iba na ‘yung paningin mo kapag nagkaedad ka eh. If you look at the roster a lot of them are young. Siguro signs of the times,” stated the award-winning actor. The actor bagged his first Urian in the Best Supporting Actor category for Mike de Leon’s 2000 film Bayaning Third World opposite Ricky Davao and Cris Villanueva while he got the second Urian in the Best Actor category for Lav Diaz’s 2001 film Batang West Side together with Yul Servo and Gloria Diaz. During his acceptance speech, the actor waxed emotional over being given the opportunity to give life to his character Tatang in OTJ. "Sa edad kong ito, alam mong 'yung mga roles na dadating sa iyo ay hindi na masyadong as exciting pero thank God na nabigyan pa ako ng role na ganito," said the former Honesto star. His OTJ co-star Joey Marquez also earned a Best Supporting Actor nomination for his portrayal of the virtuous veteran investigator Sgt. Joaquin Acosta. However, much to his shock, his other co-stars Gerald Anderson and Piolo Pascual were seemingly snubbed by the award-giving body. “Yeah I don’t know why. I can’t say anything about that. It’s their judgment call. Hindi ko alam kung ano ang criteria nila,” he said. Personally though, he thinks Gerald, who played the role of Daniel Benitez, his hitman protégé, should’ve earned at least a nomination. “Oh yeah, I’m sure. Gerald was wonderful because I’ve worked with him,” he said.